Samsung Electronics unveiled a new bigger smartphone, the Galaxy Note 2, at its "Mobile Unpacked" event in Berlin on Wednesday. The Galaxy Note 2 is expected to compete with Apple's new iPhone 5 due out next month. "A year ago, the Galaxy Note created a new line of devices that combined the smartphone and tablet PC," said Shin Jong-kyun, the head of Samsung's mobile phone division. He added the Galaxy Note 2 "will offer a more innovative and unique experience." 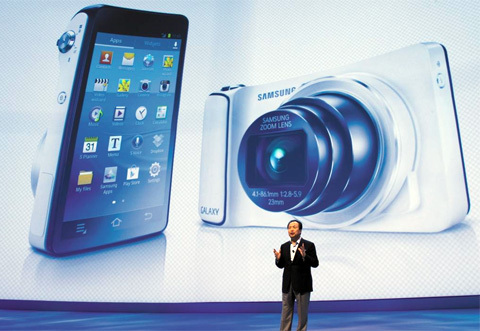 Shin Jong-kyun, the head of Samsung's mobile phone division, presents the Galaxy Camera at its "Mobile Unpacked" event in Berlin . The event a day before the official opening of the Internationale Funkausstellung, Europe's biggest consumer technology trade fair, was packed with reporters and business figures, with all 1,500 seats filled as soon as it started. Film director Wim Wenders got on stage to promote the device. The phone has a 5.5-inch screen and, the company claims, is more comfortable to hold thanks to a thinner bezel. It comes with a stylus and looks like a Galaxy S3 smartphone that has been stretched out. During the presentation, it seamlessly played high-definition movies on the 16:9 ratio screen. The gadget has some innovative functions capable of detecting the movements of the user. For example, when a user pulls out the stylus, a memo screen automatically appears. Once the stylus is inserted again, the main screen is restored. The "Air View" function enables users to send e-mail, manage the photo album and arrange schedules with the stylus. It also has a "S Beam" function that enables users to send music files to other handsets at the speed of just two seconds per song. Boffins said Galaxy Note 2 would be relatively safe from Apple's patent infringement suits because many functions are different from Samsung's other smartphones. But the phone does include some functions that caused patent disputes with Apple including the "pinch-to-zoom" function that allows a part of an image to be enlarged using the thumb and index finger, and the "double tapping" function that allows a particular image to fill the entire screen. "We think we can avoid copyright infringement if the activation method is different, even though the functions are similar," a Samsung staffer said. Samsung also unveiled other products. A surprise was the "Galaxy Camera" that is equipped with fourth-generation LTE and the latest Android OS Jelly Bean. The camera features a 16-million pixel resolution, 21x zoom and 12.1 cm LCD screen. The ATIV smartphone, also unveiled at the event, comes with Microsoft's latest OS Windows 8. Samsung plans to join hands not only with Google but with a wide range of partners including Microsoft to deal with rival Apple. Samsung plans to introduce a whole line of smart products under the ATIV brand including a "smart PC" that can be used as a tablet PC and a desktop simply by adding a keyboard and monitor.